Chocolate House is the original maker of these whipped cream eggs. Each box has 24 1 oz milk chocolate covered vanilla cream eggs. 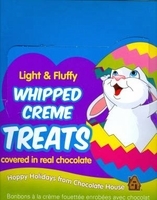 These are perfect for putting in your Easter basket, placing in your candy dish or giving as an Easter gift. There are many brand of whipped cream eggs on the market today, however Chocolate House is the original maker. You won't go wrong with these eggs. They have a delicious creamy milk chocolate covering a smooth vanilla cream center. Each box has 24 individually wrapped 1 oz. eggs. If you only want a couple of cream eggs no problem with also sell these eggs by the piece. You can purchase just a single whipped cream egg here.